Today, 529 plans like Rhode Island's CollegeBound Saver are a popular way for parents and grandparents to save money for colleges and post-secondary vocational schools. These plans offer many benefits, including some unique tax advantages; in fact, the name comes from Section 529 of the Internal Revenue code. Saving for college, not for taxes. 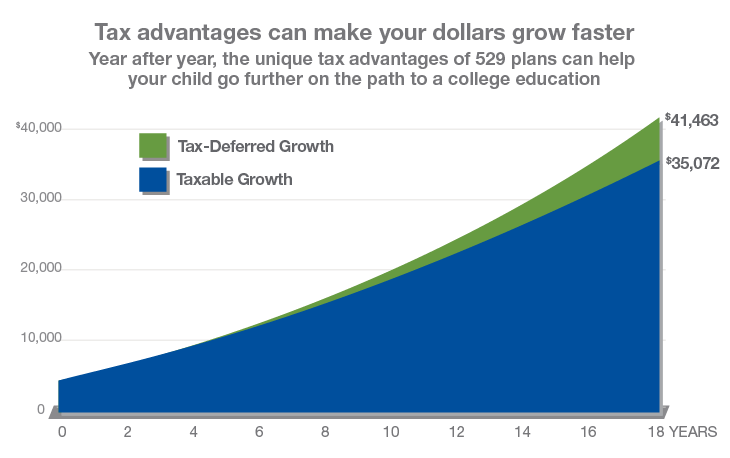 Unlike taxable college savings vehicles, 529 contributions can grow free of federal and state taxes.1 The difference can be significant, as shown in the chart below. Assumptions: $2,500 initial investment with subsequent monthly investments of $100 for a period of 18 years; annual rate of return on investment of 5% and no funds withdrawn during the time period specified; and taxpayer is in the 30% federal income tax bracket for all options at the time of contributions and distribution. This hypothetical is for illustrative purposes only. It does not reflect an actual investment in any particular 529 plan or any taxes payable upon distribution. Be a smarter college saver with this short presentation. 1Earnings on non-qualified distributions may be subject to federal income tax and a 10% federal penalty tax, as well as state and local income taxes. Tax and other benefits are contingent on meeting other requirements and certain distributions are subject to federal, state, and local taxes. 2An eligible institution is one that is eligible for federal financial aid programs.